Looking for a new place to live is never an easy process, especially if you are renting. The latest app to come across our radar is Lovely, an app that looks to ease the pains of looking for a new place to live, by bringing all of the information you need straight to your phone. What is even better is that the app looks, well, lovely. Once you log in, you are greeted with a map of your current surroundings, and Lovely does the work for you. 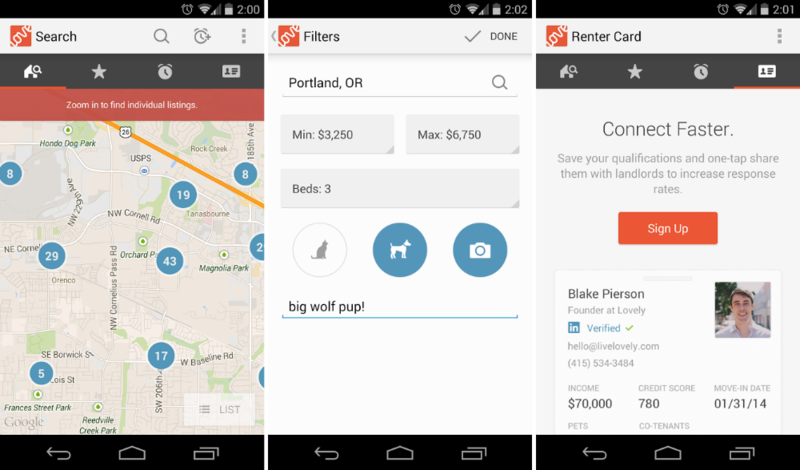 The app places colored dots along the map indicating where listings for rentals or groups of rentals are in your area. Each dot is colored-coded to show how “fresh” of a listing it is, telling you if it has been on the market for a long or shorter period of time. Once you choose a listing you like, selecting it gives you info, pictures, and details direct from the landlord about the listing. And as long as the landlord has provided it, it only takes one click to call or email about that apartment. If you want to make a good impression on your future landlord, you can fill out your income and pet situation, as well as link your LinkedIn account so business can get done quickly. The icing on the cake is that the whole app follows the Android design guidelines quite well and has a distinct Kit Kat feel to it throughout. Lovely is very easy to use and looks good while doing it, so what’s not to love? If you are looking for an apartment now or will be sometime soon, hit the link below to download the application.